Following ex-rugby player Richard Parks as he takes on the 737 Challenge. This edition sees him climb Carstensz Pyramid, Indonesia, reach the North Pole and attempt Everest. In December 2010, former Wales rugby international Richard Parks set off on a record-breaking challenge to conquer the highest summits on every continent. His epic 737 Challenge - seven summits including the three geographical poles in seven months - would be a feat never before attained by a human being. When an injury brought his rugby career to a premature end, he set his sights on completing an adventure that would take 18 months to prepare and would raise a million pounds to help cancer sufferers. Having reached the South Pole, and the highest summits of Antarctica, South America and Africa , Richard Parks next destination on his 737 Challenge was Carstensz Pyramid in Indonesia. A difficult technical climb compounded by a 100 kilometre trek through the jungle – and Richards’ knees were showing serious signs of wear and tear. His medical team were afraid that the whole project was in jeopardy. 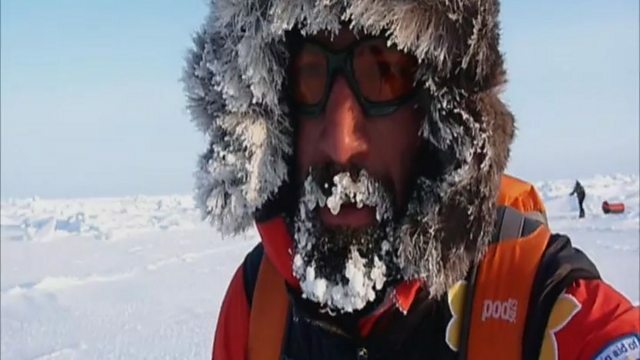 The relentless nature of this adventure would then see him join forces with Olympic Gold medallist Steve Williams to reach the North Pole and then to attempt Everest . Jungles, injections, ice plains and savage environments – all part and parcel of his attempt to set a world record and raise funds for a cancer charity.